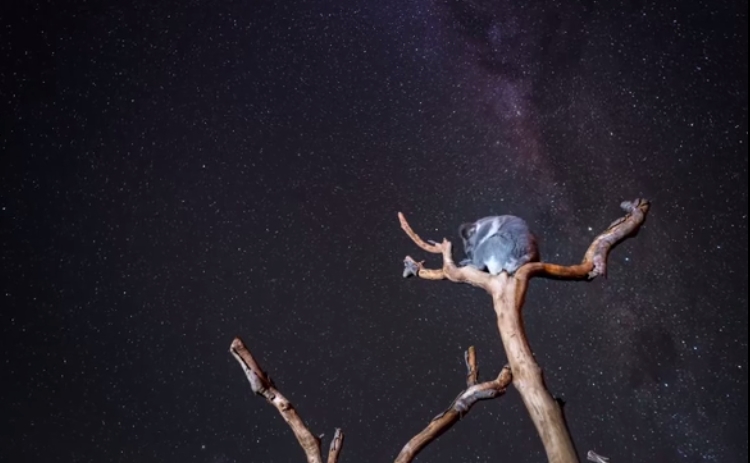 Stunning time-lapse video has captured a koala staring at a starry sky for hours on end in Sydney. The staff at the Symbio Wildlife Park have captured a video showing one of their koalas watching the night sky in awe for hours as the Milky Way and shooting stars passes by. The timelapse video captured by staff in Sydney, shows Grace, the koala, gazing into the night all alone without a care in the world. The marsupial is seen perched at the very end of a tree top while gawking at the skyline for more than four hours before slowly making her way down. Spokesperson Kevin Fallon told Nine News that despite the cold weather, Grace had climbed to the highest point of the Koala Sanctuary in the blistering cold for the last two nights for a glimpse of the beautiful skyline. 'It wasn't until the last few frames whereby Grace decided to call it a night, evidently tired from star counting,' he said. Responses to "Koala mesmerised by shooting star and the milky way"